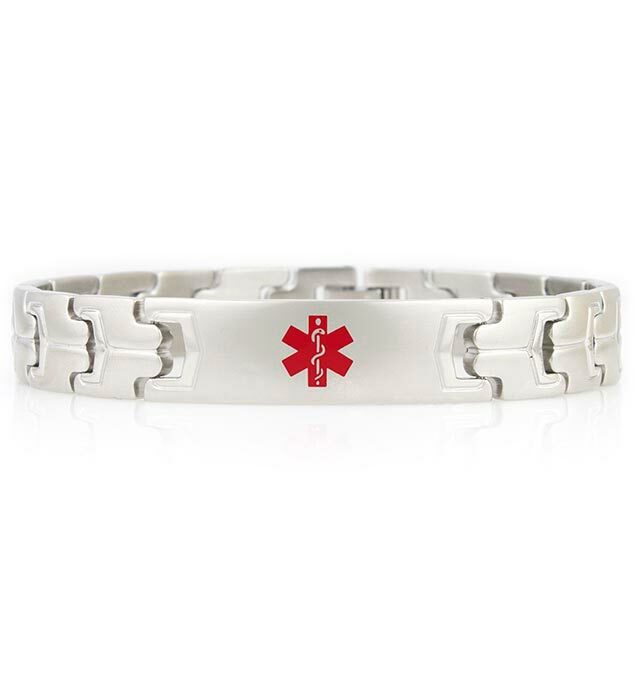 Made of durable stainless steel, Stealth is a classic medical alert bracelet that bears the internationally recognized medical caduceus symbol on the front to alert first responders to your medical information, engraved on the back. With pin-style links and a flip closure opposite the affixed medical ID tag, Stealth is a traditional, water-safe med alert bracelet ideal for daily wear. The Stealth Medical ID Bracelet allows for three lines of custom engraving. Whether you or your loved ones wear a medical ID bracelet to alert medical personnel to a history of heart conditions, pacemaker use, food or drug allergies, bleeding disorders, or any other medical condition or treatment consideration, custom engraving enables you to choose the style of medical ID you prefer. When engraving your medical alert bracelet, we recommend listing your name, chief medical condition(s), treatment considerations, any known allergies, and at least one emergency contact number, preceded by the letters ICE for, “In Case of Emergency.” For assistance with your engraving, visit our Engraving Information page or contact us for personal assistance.